In the midst of my raised bed vegetable garden, I have this large boulder. I'm tempted to say that it is a large meteor that just fell from the sky and I'm lucky it landed where it did and not on top of my pepper plants. But, that would be "inaccurate", so I will tell you the truth. They dug it up when they were digging the crawl space for my house and kindly left it in the yard for me. Boring origins, huh? I should stick with the meteor story. Is it a blessing to have such a distinctive landscape feature, or just something big to work around? Right now, it is just something I had to work around when I laid out the raised beds of the vegetable garden. It's like a permanent "chair" for me to rest on. It's big and I know it ain't going anywhere anytime soon. Hmmm, I wonder if it is radioactive? There are also several large boulders in my neighbor's yard. I think they also dug these up when they were digging the crawl space for that house. As far as I know, no one else in the neighborhood is blessed with boulders of this size, so it makes you wonder, doesn't it? There was a farm on this land before they built the neighborhood, and I made them show me where the original house and barn were on the plot plan, so I would be sure to not get a lot where those had been. After all, it might be haunted there where the house was and the old farmer might be still walking around trying to find his house. Or maybe they just buried the old barn when they graded the property for the neighborhood, and one day someone's yard is just going to sink down when the buried wood of the barn finally rots? By the way, I know who's yard that is! The guy who built the house next door used a bunch of the big boulders in the landscape, as you can see in this picture. What else could he do? That was three owners ago. At least I have just one big boulder. 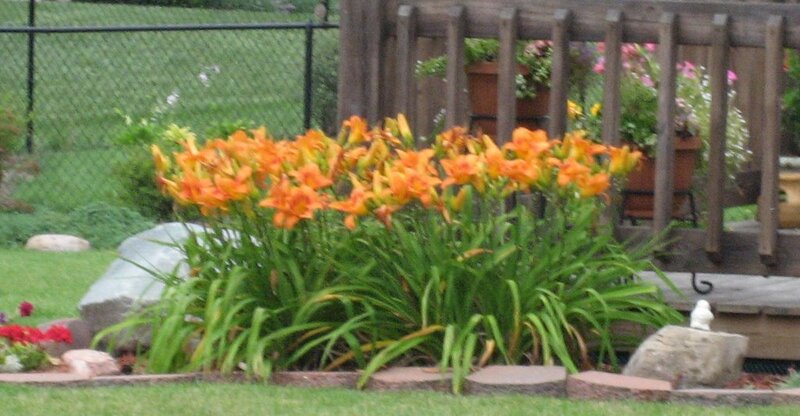 I sure don't want their big boulders, but I do covet their daylilies! I've never noticed the beloved boulder before. Interesting how something like that can just "blend in". I think you should stick with the meteor story but maybe add that it's radioactive. Everyone knows that a radioactive meteor in your garden will give your vegetables super powers. I'm originally from the Seattle, Washington area, where the lovely "glacial till" left my garden space in the forest with roughly 50% rock (which had to be removed by hand in order to garden). 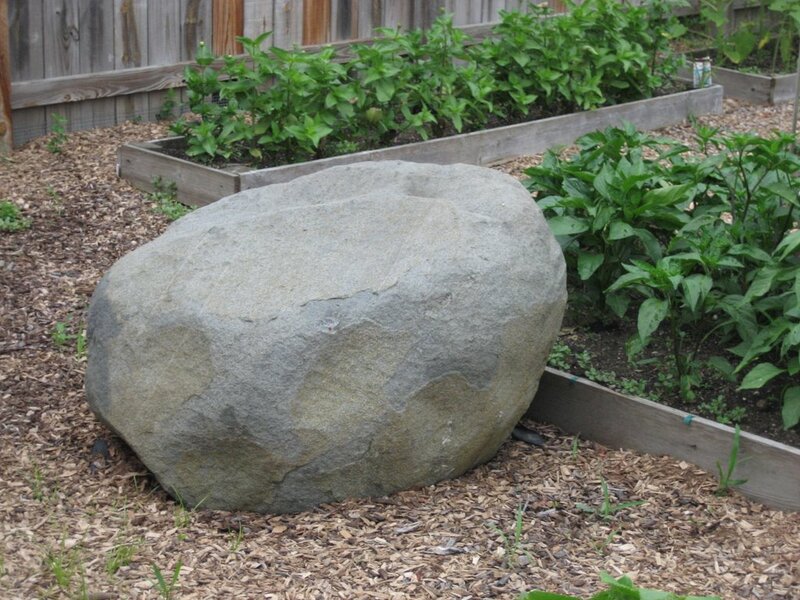 When digging fence post holes one summer, we had to use a truck and a chain to pull out a rock about the size of the one in your picture... we tell everyone that it's the mother rock giving birth to all the others! I'd stick with the meteor story... it could happen!